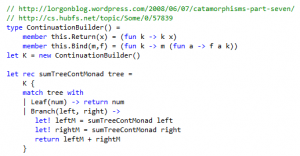 This blog post will look at using the continuation monad to sum the nodes in a tree, and then look at a case where a more complex monad is needed. This is now faster for a large balanced tree, but for the deeply nested unbalanced tree it throws a StackOverflowException. 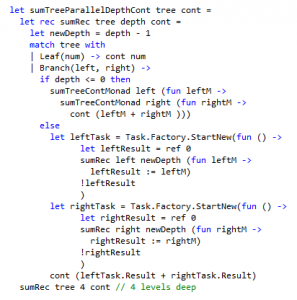 Note that sumTreeParallel coped with arbitrarily nested trees, as the work to be done no longer kept being pushed onto the stack. Urghhhh. The code is definitely more convoluted now – I played with using the state monad to pass the depth around, but it’s not tail recursive. I thought that it might be possible to make use of the continuation monad here, but the problem is, is that it really needs aspects of both the state and continuation monads. I’m not sure how monad combinations work in F#, but I thought I’d throw this out here to see if anyone shows me the light. The post The Mother of All Monads does say that all other monads could be implemented in terms of the continuation monad, but I couldn’t see an example of anyone implementing the state monad in terms of the continuation monad. I am surprised how similar F# looks to Haskell. Does it share the same kind of features? effects are permitted, but the type system requires you to be explicit about where they take place. It does not support imperative or object-oriented programming paradigms. F#, on the other hand, is a non-pure, eager, multi-paradigm functional language. 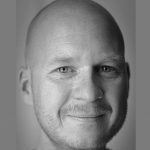 Functional programming techniques are prioritized, but you can comfortably write imperative, object-oriented code as well.